Here is 5 year old Miriam playing in the mountains. She is not in the Austrian Alps, but in my mind’s eye she is, for a few months after this photo was taken she played Gretl in the “Sound of Music.” If I close my eyes I can see a mix of her playing in the mountains and her singing on stage…a perfect type cast for the littlest Von Tropp child. 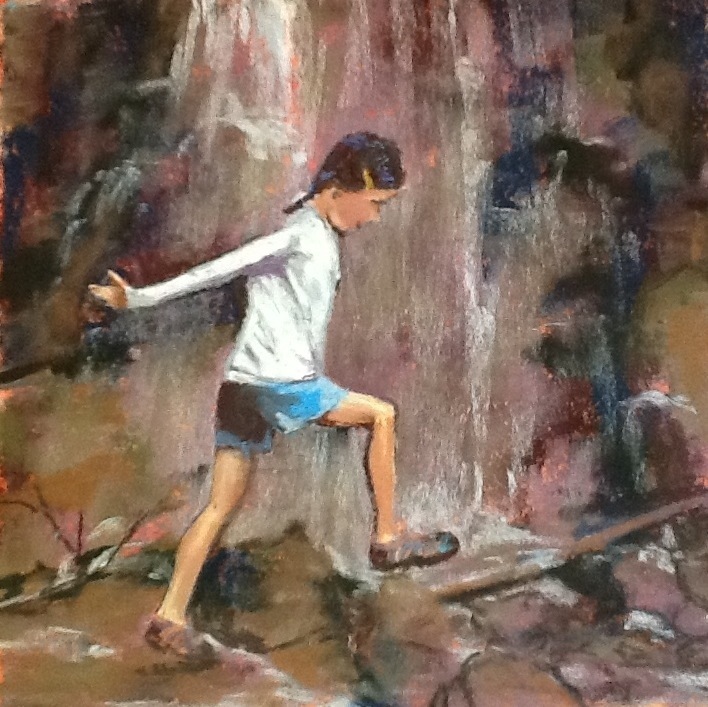 Last summer, I watched her run this little loop for what felt like an entire afternoon…up the rocks through the stream, under the waterfall. I marveled at the time at how different her posture was from the boys. The boys would have had their elbows tucked in, their jumps would have been higher, more controlled, their whole approach more athletic. Miriam, however, never forgot to frolic. Every move seemed to pour out sheer joy. She is like that in life too, and from time to time, I remember to stand back and marvel. she helps me to remember that you don’t always have to walk, it is ok to skip sometimes. Instead of talking, you can sing a merry little tune, and most importantly, greet everyone you encounter with a smile and a few words – there are no strangers in Miriam’s world, and because of it, she has helped my world to grow smaller too. Julie, yet another beautiful painting! I respect the way you drink in the unique spirit of la Mi. loved the art, loved what you wrote even more! A great little painting (as always), but your text was equally beautiful and very much appreciated. Thank you for sharing your moments. Wonderful insight and lovely picture. You caught her movement very well. Lovely moment in your painting, accented by loving and observant mom’s words – each captures memories in different ways, which is so important to do. I remember her coming up to me at Ghost Ranch last summer and telling me “My name is Miriam Rose Crownover, but you can call me Miriam.” What a doll at such a cute age! Thanks for sharing her happy moments with us! That’s my Miriam. I met someone at the Monastery last week who was from Ghost Ranch and we went back and forth trying to see if we knew each other. As a last thought I offered that I have 4 little kids, she asked their names…and guess where we found or connection? Miriam of course.